Hong Kong- Tai Po Area Traffic Control System and CCTV – Advantec Consulting Engineers, Inc.
ADVANTEC did the feasibility study, prepared the design specifications, and is Project Manager for an 18-month implementation phase for the Tai Po and North District Area Traffic Control system in the Territory of Hong Kong. This US$13M project involves design and implementation of an adaptive traffic signal control system for 140 intersections and 24 CCTV cameras for use in monitoring critical intersections. The project also includes design and implementation of one full-up command and control center at Tsuen Wan, and two satellite command and control centers at Kowloon, and New Territories (NTATC). Remote workstations are provided in the Police Station, Fire Station, Transport Department, and maintenance workshop. Special features of the system included “power saver” and “green wave” capabilities, fixed-time (i.e., fixed-cycle) and semi-actuated (vehicle and pedestrian) functions, emergency vehicle route pre-emption, cableless linking (fixed-time and semi-actuated), local isolated (fixed-time, semi-actuated and fully vehicle actuated), local pre-emption, maintenance interrupt, and Police control. The design specification was written to permit open procurement of any adaptive traffic control system, including SCOOT, SCATS, SPOT or other systems in the market. ADVANTEC was also responsible for managing the system integration, performing testing and commissioning; and overseeing the construction inspection for construction work in the field. 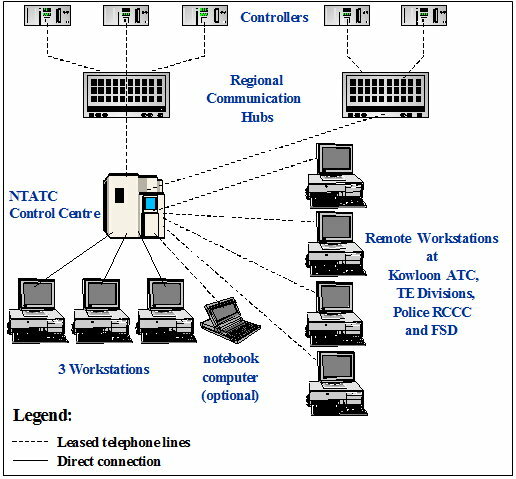 Different communication means were evaluated, and the most cost effective option was selected that involve a combination of field communication hubs and leased telephone lines. A risk based cost analysis was conducted that provide an optimum system design that saves costs.